Divock Origi came off the bench to claim a dramatic injury-time winner as Liverpool beat Everton 1-0 in a pulsating Merseyside derby encounter at Anfield on Sunday. The game looked to be drifting towards stalemate after both teams had spurned opportunities in a lively encounter. In the first half, Andre Gomes was left holding his head in his hands for the Blues after his close-range glance goalwards was thwarted by an outstanding save from Alisson Becker before Joe Gomez cleared off the line. Meanwhile, Sadio Mane and Xherdan Shaqiri both had chances to break the deadlock. 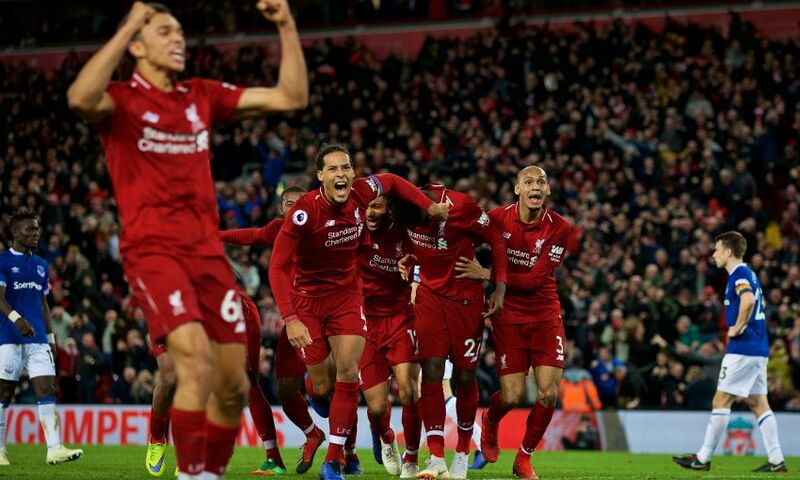 The Reds continued to press for an opener after the break, but they were forced to wait until the 96th minute when Virgil van Dijk’s mishit volley spun back off the crossbar and Origi nodded in from point-blank range to send Anfield into raptures. Liverpool made three changes from the midweek defeat by Paris Saint-Germain - Shaqiri, Fabinho and Trent Alexander-Arnold coming in for the suspended Jordan Henderson as well as James Milner and Dejan Lovren. It was the Blues who created the game’s first opportunity with Yerry Mina meeting a Gylfi Sigurdsson free-kick from the left with a downward header that bounced a fraction wide of Alisson’s upright. But Liverpool made an assertive start – and after Mane had almost released Mohamed Salah inside the area, the pair combined again to open up their opponents. This time Salah dinked a pass into Mane’s path. The No.10 hammered goalwards from 10 yards out, evading the top of the crossbar. The Senegal forward then had an effort parried by Jordan Pickford after being sent into space by Alexander-Arnold’s ball as the Reds cranked up the pressure. Nevertheless, Everton – who had adopted an adventurous approach – fashioned another fine chance on 21 minutes when Gomes headed Theo Walcott’s nod back into the six-yard box towards goal, but he was denied by a stunning save from Alisson. Gomez then hacked the ball off the line to prevent an opener. Next, the hosts conjured up a golden opportunity to break the deadlock of their own when Fabinho dispossessed Idrissa Gueye inside his own half. Salah switched play quickly to Shaqiri, who moved in on goal though was eventually thwarted by Pickford’s sprawling stop. Alisson then foiled Walcott’s attempts to round him after the ball broke for the Blues frontman in the box as an absorbing opening half concluded without a mark on the scoresheet. Liverpool began the second period on the front foot as they looked to force an opener; Salah collected the ball centrally just outside the area and flashed a curler just wide. Mane then saw another good opportunity go begging as Roberto Firmino sent him bounding into space inside the box, but he could only prod wide of the near post under pressure. Soon after, he arched a strike off target from a Salah layoff. Bernard flashed a dipping shot across goal for Everton, with the visitors beginning to pose more of a threat, before Mane went close to turning in Andy Robertson’s cushioned centre at the other end. With 20 minutes remaining, Naby Keita was introduced in place of Shaqiri, prior to Daniel Sturridge coming on for Salah moments later. And it was another substitute – Origi – who cracked a close-range volley against the crossbar as the fixture looked set to end level for a second successive season. However, in the sixth minute of added time, Origi ensured he wrote his name into Merseyside derby history when he reacted quickest to nudge in after Van Dijk’s attempt had spun against the crossbar and dropped back into the six-yard box.